Like the Church, the school had a humble beginning and its development over the years followed much the same course. Starting at the turn of the century, it too was a bilingual institution and had the parish name of Holy Family. In 1923 de Mazenod School was established for the French-speaking section and Holy Family continued as an English-speaking school. In 1930, when the new parish was founded, the name of the school was changed to Canadian Martyrs and Sister St. Gregory of the Grey Sisters of the Immaculate Conception became the first principal. One year later Miss Cecilia Rowan became principal and continued in this position until 1957. The building at that time, a two storey red brick structure, was located in the Oblate property on the eastside of Main Street opposite Hazel Street. There were four classrooms, each having two grades with double-type desks accommodating two pupils each. Some parishioners may recall the happy years spent in this little old school. A unique feature of the building was the fire escape system which consisted of two open iron poles extending to the ground from the windows of the second floor classrooms. Many an adventurous boy took this route when making an unannounced departure while the teacher was out of the room. The boys' yard at the back of the school was surrounded by a high wooden fence behind which some were to experience their first puff of a cigarette. In winter, a popular pastime on the way to school was to get a ride on a horse -drawn sleigh going up or down Main Street. Sometimes, on a nice day, one might forget to get off at the school only to have to face the music later when returning long after the bell had rung. Highlights of the school term were the annual picnic and the Christmas party. For quite a few years the picnics were held either at Aylmer or Britannia Park, both places being served by the electric street railway. In later years, Brantwood Park was the site used and although it was much more convenient, the glamour of the long streetcar ride was missing. The Christmas parties were held in the church hall. The program usually consisted of a concert of songs and recitations by the pupils followed by the appearance of Santa Claus who always had a present for everyone. The end came for the little red schoolhouse in the fall of 1943 when it was destroyed by fire. Fortunately the fire broke out at noon-time when the pupils were out of the building and although it was brought under control, the building was damaged beyond repair. 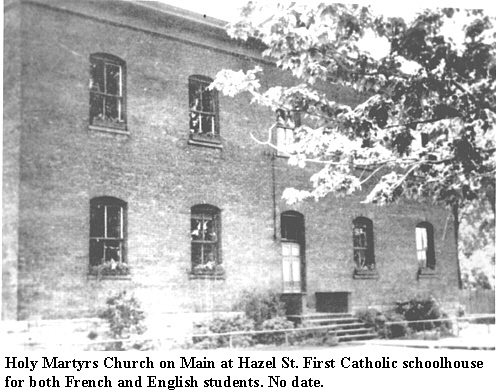 F or the next four years t-he parish was without a school building, a result of the wartime shortage of structural steel. 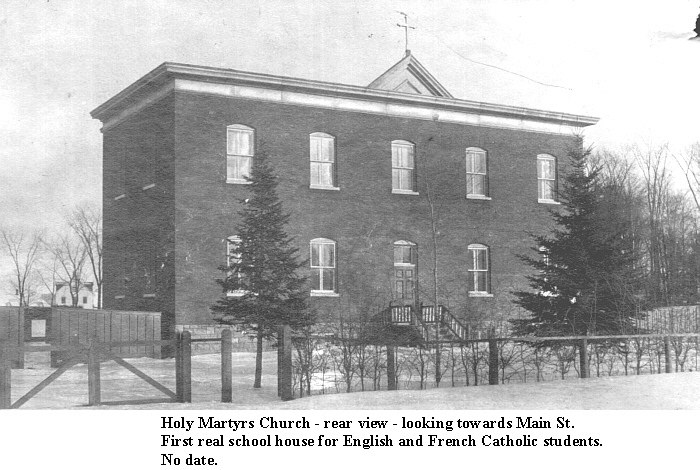 During that time classes were held in other schools wherever accommodation could be found, including St. Patrick's College, Lady Evelyn Public School, Elgin Street Public School, de Mazenod and even the basement of the church. These were trying times for students and teachers alike but Miss Rowan managed to maintain a good semblance of order and guided her school through the difficulty. The new Canadian Martyrs School, consisting of nine classrooms on Graham Avenue was blessed by Archbishop Vachon on November 16, 1947. Thousands of children attended Canadian Martyrs School up until its closure in June 1983. All have memories of school days, to many they are the fondest - the friends met, the teachers known, the achievements and the failures, the joys and the happiness. The name of Miss Rowan is cherished by hundreds of men and women who had the privilege and good fortune to attend school under her guidance. She possessed a quiet and unassuming manner with a firmness to instill by word and example, the noble principles of Catholic living and teaching.